Less than a year after we brought you news about Japan's attempt to place a high-definition TV camera in orbit around the moon, we have the finished film in the can and, we have to tell you, it's a stunning technical feat. The Selene satellite, which is still in orbit 100km above the moon, was dispatched primarily to study the origins of the moon and to lay the groundwork for future manned missions. 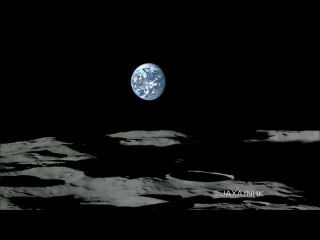 However, the inclusion of a high-def TV rig as a publicity exercise on the part of Japanese broadcaster NHK has yielded spectacular HD TV video of the Earth, as seen from a moon orbiter. Selene filmed Earthrise by looking forwards as it orbited the moon and Earthset by pointing its camera backwards while it made a similar circuit. The results can be seen on this Japanese-language page belonging to NHK. If you can't read the language, never fear - the highest resolution 720p video is available by clicking on the leftmost arrow under each still image. Earthrise can be seen in the video at the top left of the page and Earthset immediately to its right.